I was in a craft store October 31st buying Halloween cookie cutters for the Rice Krispies Kit Kat Bars I was taking to a party that night. The very next day I went back to the same craft store and saw that, overnight, it had been transformed into a Christmas store. I LOVE Christmas; but on November 1st I know that I have Hanukkah and Thanksgiving to think about first and I am not quite ready to focus on chestnuts roasting on an open fire! This caused me to think about the flavors of the month of November. Even though we are still enjoying 80° weather in sunny South Florida, it feels like autumn, which means it must be cinnamon time. I know you are probably thinking that pumpkin is the flavor of November, but it is cinnamon that is found within so many delicious pumpkin recipes. Why not let this wonderful spice take front and center stage for a change? 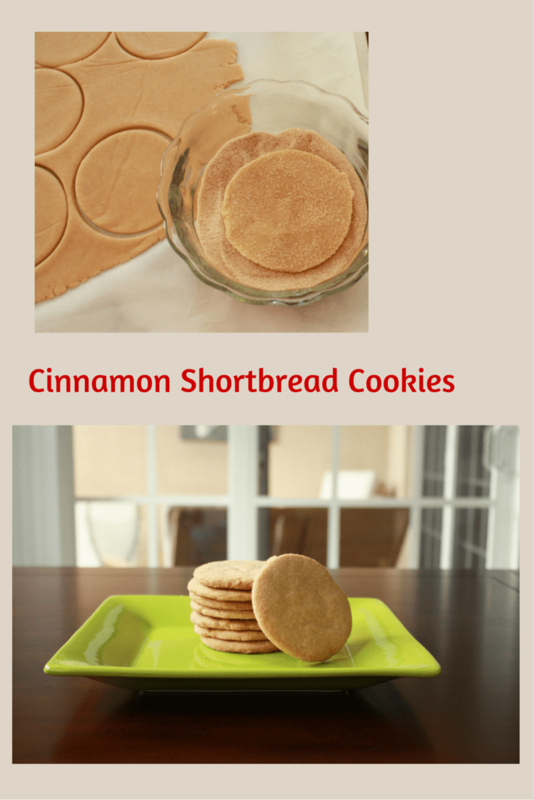 Cinnamon Shortbread Cookies are a breeze to make. You don’t even have to wait for the butter to come up to room temperature. The most time consuming part is waiting the hour (or longer if it works better with your schedule) for the dough to rest before rolling out. The trick to maximizing the cinnamon taste is coating the cookies with a cinnamon/sugar mixture before baking. M-M-M! There will be plenty of pumpkin and peppermint recipes coming your way soon enough. For just this very moment, however, take the time to appreciate the heavenly aroma of cinnamon that is only topped by its spicy taste. Combine the sugar and cinnamon together in a small bowl that is large enough to accommodate a 3½” cookie. Set aside. Gently coat each round in the cinnamon/sugar mixture and then place on the prepared pan. Bake in a 350° oven for 16 - 18 minutes, rotating the pan halfway through. Remove from the oven and cool completely. What a great recipe to savor this time of year! I have the coffee ready! Now I need these delicious cookies! Thanks for a great recipe. This sounds so amazing and honestly I adore the smell of cinnamon. I want to make these cookies just to fill my apartment with that amazing smell! I know what you mean! Thanks for the comment. Perfect cookies for the holiday season! Thank you Phil! I do love this season! Thanks you. I, also, love the smell of cinnamon! If you happen to read this within the next couple of hours (10:15 Saturday morning), I am in the process of making these in preparation for the Apple Cheesecake. You state that this recipe makes approximately 18 cookies. As I look at your pictures, I see only 10. It doesn’t appear that you have more than one disc. Am I correct and will I get only 10 cookies from this amount of dough and will that be adequate for the crust of the Apple Cheesecake? Thanks. Sorry, I missed your timeline in responding back to you this Thanksgiving weekend, but I hope you made the cookies and realized that the batch does yield 18 cookies. I did not include all of them in the pictures. You are on time. Thank you very much. I’ll form the disc now. I have never eaten a shortbread cookie this good in my life. I was so proud of myself for making them. In my mind shortbread cookies only came in a package! I so badly want to make these again but I will have to overcome one problem: I used 10 ounces of them for the Apple Cheesecake, which if you read my review you will see was out of this world; but then I ate the rest. That was not good! They were irresistible. I do have one question. Is it imperative that you refrigerate the dough for an hour? I happen to have bad shoulders and I have to confess I had a tough time rolling it out, because it was not at room temperature. What does refrigerating it for that hour do for the dough and will the cookies not be as good if I roll it out immediately? I am so glad you loved these cookies! The cookies will spread a lot if you do not allow the dough to rest for a bit in the refrigerator. Additionally, it is harder to transfer dough when it is soft. Having said this, I would like to add that you should really work with the dough as best you can given your physical limitations. The taste will still be delicious and no one has to know that they do not look exactly like mine! Well, sadly, I’m also a perfectionist and I want the cookies to look like yours. So, for the time being I’ll struggle a bit and will continue to roll them out after refrigerating for an hour. Thanks for your response. Truly, I think being able to enjoy the end result WITHOUT pain is more important. A recipe is a starting point and the pictures are what I want my end point to look like. Perhaps try a different end point and see whether or not you like them. You could try this: chill the dough only for 1/2 hour, then roll out just like you normally would but on a sheet of parchment. cut out the cookies and peel away the scraps, leaving the cookies on the parchment. 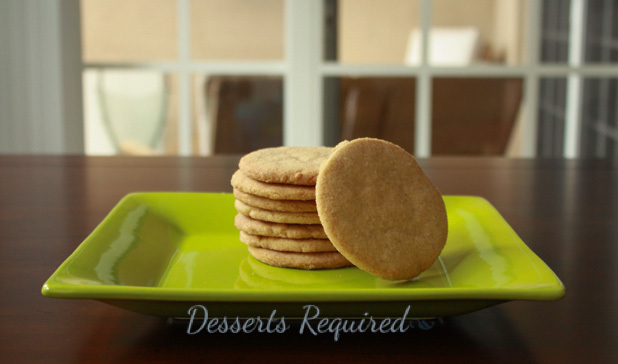 slide parchment w/cookies onto a cookie sheet (the kind with no border would be easiest) and chill the pre-cut cookies for 15-20 minutes before you bake them. while you wait, gather up the scraps and roll those out. I stage shaped cookies in the cooler before baking all the time at the restaurant where I work to keep the cookies from getting too hot in the hot kitchen, and so they are shapely after they bake (less spreading). The only problem you might have is if you have hollow-core or “stone” cookie sheets which will not heat up properly from cold. we have regular old single-wall baking sheets and it works great! Wonderful ideas!!! Thanks so much for your suggestions. I, greatly, appreciate them. You can do that but you will still want the dough to rest for a bit before rolling. I have not tried browning the butter in this recipe but I agree with you. I think it would be divine! Let me know if you give it a try.